According to my kids, there are no crisps like a Walkers crisp. I suspect it has something to do with the Gary Lineker ads that they think are really funny. The person who designed those should have a gold badge for innovation, long-lasting interest and public approval. With our family history of crisps, who could ignore an e-mail asking us to review a new Walkers product? 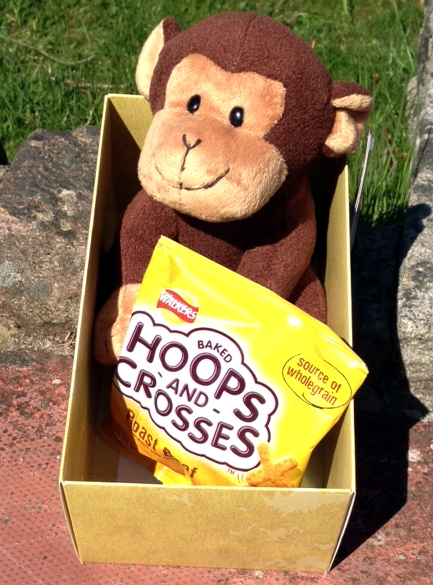 With the arrival of “Monkey George,” along came Walkers Roast Beef Hoops and Crosses in a lovely box with a book to tell us all about them. If I’m honest, I’d have to say the Roast Beef are better than the Prawn Cocktail that we’ve had before. 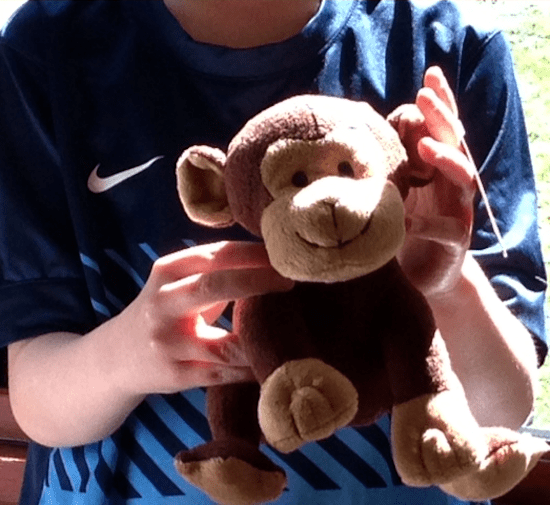 We’ve called the monkey that came with our review Hoops and Crosses George, which is a family tradition due to a besotted nephew who has carried a fluffy monkey since he was a nipper. All soft toys that look like a monkey have been named George from that time to this. Each bag consists of 56% wholegrain corn meal. 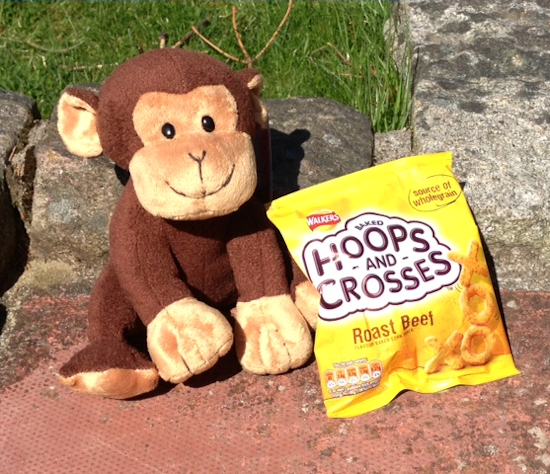 Hoops and Crosses are made from wholegrains, have no artificial colours or preservatives. Any Walkers Prawn Cocktail fans wouldn’t be disappointed though as they taste exactly like the Prawn Cocktail crisps, which my kids say is a great selling point. What I do like about the new Hoops and Crosses is the wholegrain content that kids can’t taste at all when they eat the crisps. Eating a diet that includes wholegrain can help our health along nicely by providing a rich source of fibre. Getting fibre into my children so easily has to be a good way to go. I know friends of my kids who eat no wholegrain at all, so as a wholegrain snack, it is perfect for lunchboxes and trips out. We didn’t get a chance to try out playing x and o’s on a piece of paper as the bag was dived upon by children desperate to eat them. We’ll just have to wait until the next time we have them in the house. I can see these being a staple in our house for snacks and lunchboxes, although my kids would like to see them in Tomato and Cheese & Onion flavours too. This is a sponsored review. I was not obliged to review positively. « What would you do with an hour back? Sounds like something to try! The beef ones actually taste a lot like monster munch so were popular round here.